On Feb. 4, 2016, the sixth man to walk on the Moon, Edgar Mitchell died at age 85. He left the planet for the last time on the eve of the 45th anniversary of his arrival on the moon. It must have taken great courage to embark on that journey, as Apollo 14 was NASA’s first attempt at a moon mission since the ill-fated Apollo 13. Mitchell was accompanied on Apollo 14 by Stuart Roosa, pilot of the command module, Kitty Hawk, and Alan Shepard, who accompanied Mitchell on the lunar module, Antares (LM-8). Alan Shepard was America’s first astronaut. His Freedom 7 capsule soared into space atop a Mercury-Redstone rocket and returned without making an orbit. The mission was Project Mercury’s first baby step into space. 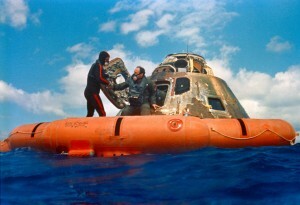 Apollo 14 was Alan Shepard’s only space flight after his Freedom 7 trip because an inner-ear disease left him grounded until it was surgically treated. Shepard died in 1988 at age 74. Shepard’s landing of the Antares on the lunar surface was heralded as the most accurate moon landing in the Apollo program. Few people remember that the Apollo 14 crew had its own “white knuckle” experience: The crew experienced great difficulty attempting to establish a “hard dock” between the Antares and the Kitty Hawk before heading to the Moon. It took six attempts and nearly two hours before docking was established. Although no technical difficulties could be found to explain the problem, fears lingered that the Antares wound be unable to dock with the Kitty Hawk for the return trip, leaving Shepard and Mitchell stranded in space. True believers in a religion known as, Scientism were quick to ridicule Edgar Mitchell, upon learning that the astronaut conducted “private” (unauthorized by NASA) ESP experiments with friends on earth during the Apollo 14 mission. Most of those critics held no scientific credentials beyond navel-gazing, while Mitchell held a PhD in aeronautics and astronautics from MIT since 1964. Worse yet, those critics soiled themselves when Mitchell discussed the forbidden truth about extraterrestrial space visitors during an April 19, 1996, interview on Dateline NBC. Mitchell’s subsequent participation in efforts to convince the United States government to release suppressed evidence concerning alien spacecraft became a subject of ongoing ridicule. Although many news reports announcing Mitchell’s death noted his interest in the subject of UFOs, the flow of snark was attenuated in light of the somber circumstances. Since that day in February, there has been little – if any – ridicule about Mitchell’s interest in UFOs because the entire subject has actually gained a modicum of respect. In fact, many of the memorial articles about Edgar Mitchell spoke admirably of the astronaut’s quest to expose this truth. On Feb. 6, 2016, Forbes published a great piece by Jim Clash, discussing Edgar Mitchell’s advocacy for disclosure of evidence concerning extraterrestrial visitations. This article is a “must read”. When asked for his opinion on why the government would keep this secret, Mitchell responded by mentioning a quote discussed in my last posting. Mitchell explained that the cover-up has gone beyond efforts by the government. The list of culprits includes a “cabal of money and military organizations” motivated by greed. Billy Cox writes the De Void blog for the Sarasota Herald-Tribune. De Void should be on the radar for anyone with an interest in the subject of UFOs. In his Feb. 9, 2016, posting, Billy Cox discussed Mitchell’s efforts to get government personnel released from their security oaths to an extent allowing them to discuss their knowledge about the UFO subject. Dr. Mitchell again speculated about the likely culprits behind the cover-up of extraterrestrial visitations. Regardless of the government’s secrecy efforts on the subject of extraterrestrial contact, it will obviously be up to the space aliens themselves to inform earthlings of the truth. The government would not be able to stop them from doing so. Perhaps Dr. Mitchell is now in a better place to advocate for UFO disclosure from the only entities with authority to do anything about it.